Olive Pink Collection. Pencil on paper sketched by Olive Pink, (location and date unknown) "rough, quick sketches of opening blossoms of Capparis"
Pink, Olive 1930 , Olive Pink Collection. 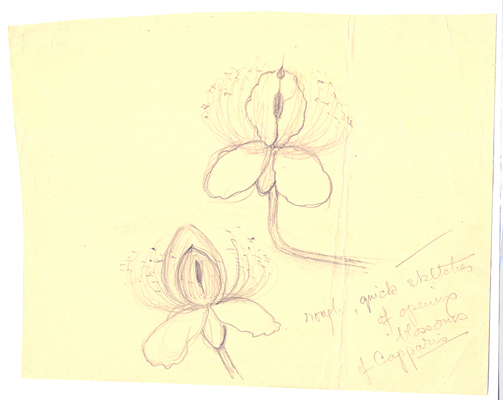 Pencil on paper sketched by Olive Pink, (location and date unknown) "rough, quick sketches of opening blossoms of Capparis" , University of Tasmania Library, Special & Rare Materials Collections, Hobart.